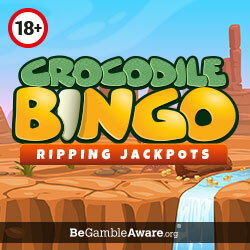 Crocodile Bingo Review | Get 120 FREE Bingo Tickets On Deposit! G’day mates, it’s time to head on over to the fantastic Crocodile Bingo and snap up some of their amazing prizes! There’s a whole bunch of games, offering you plenty of chances to win, plus you get 120 free bingo tickets on your first deposit! This top bingo site comes from the same team behind the likes of City Bingo and Treasure Bingo, which are some of our favourite sites. If they are yours too then you’re guaranteed to love Crocodile. Flaming galahs! There are a cracking 120 free bingo tickets waiting to be scooped up when you make your first deposit of £10 or more. As if that wasnt enough you’ll also be treated to more free tickets when you add funds for both the second and third time too! If you want to try before buy then simply head over to the Bingo Academy. This room is available for 24 hours after registration and features no deposit free bingo games every 15 minutes, no card details required! 120 free bingo tickets when you deposit £10+. 60 free tickets on your second deposit. 30 free tickets when you add funds for the third time. Lot’s of 1p penny bingo games. Unlimited free bingo games access. There are currently no promotion codes available. However, there are still plenty of jackpot games and promos to enjoy, all of which can be found in the promotions tab. It’s also worth making sure that you are subscribed to email alerts from the site, as this is where you may find exclusive one-off offers that you won’t want to miss! There is no Crocodile Bingo app available, but the site is mobile friendly so players can still enjoy all their favourite games on the go. Simply open up the site on your browser on your tablet or smartphone and you’re good to go. The great thing about this site is that you can use the same login details across all devices which make it even easier for you to sign in. There’s a fantastic selection of 90 ball and 75 ball games for you to play alongside a few 5 line bingo games, and the best part is that the majority of games are only 1p – 10 p. This site is cheap as chips so you don’t really need a freebie but they’ve thrown in loads of them anyway. As well as the welcome offer giving you 120 free bingo cards there’s loads of free bingo to found in the lobby. There’s that much free bingo on offer that it has its very own tab so you won’t miss it. It’s not just bingo you can win on. There’s also a vast array of slot games on offer and some of them will only cost you 1p a spin. Talk about cheap! If you don’t mind paying a bit more for the chance to win a bigger jackpot then you might want to try your luck on the progressive jackpot games where you can win tens of thousands in just one spin. The slots tab is a pretty exciting place with some of the best games around lined up for you including the likes of Fluffy Favourites, Sugar Train, Cleopatra and Neon Staxx to name just a handful of them. Plus, players can also split their time up between bingo and slots with casino games or a quick scratchcard game. 120 free bingo tickets on your first deposit. Free bingo cards on your 2nd and 3rd deposits. Minimum deposit of just £5. Payment options available on this site are Neteller, Visa, Mastercard, Maestro and Paysafecard. There is a minimum withdrawal amount of £5. The withdrawal processing time can be up to 48 hours. To sum up our review, Crocodile Bingo is a fantastic site. It’s bright and cheerful which puts you in a good mood as soon as you enter the site. It has a great range of bonuses and the icing on the cake is the vast array of games. If that sounds good to you then sign up today! There’s a generous welcome offer to make it worth your while and the on-going promotions will sure have you boomeranging back to the site time and time again.